Base of Operations: Mount Olympus. Powers/Abilities: Able to move at superhuman speeds. History: (Captain America Comics #1-11) Hurricane was the "son of Thor, god of Thunder, and the last descendant of the ancient Greek immortals." He came to Earth from his home on Mount Olympus to battle his ancient enemy, Pluto. Comments: The first Hurricane story was a redrawn Mercury story, but afterwards he enjoyed a further ten appearances in tales written specifically for him. In more recent times, it was revealed that Hurricane (and Mercury) were identities taken by Makkari, one of the Eternals, during the Second World War, and that his enemy Pluto was actually the Deviant, Warlord Kro. Makkari was even seen using the Hurricane identity as a member of the Monster Hunters (Marvel Universe #6-7). 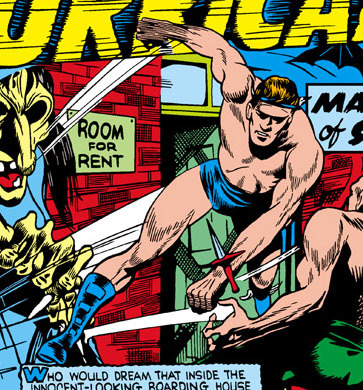 However, for the purpose of this entry, I'm treating both Hurricane and Mercury as they were in the Golden Age - distinct characters in their own right, with their origins taken as being honestly recounted and correct. If I ever get round to doing profiles for the main Marvel characters, I might eventually do one for Makkari, at which point I'll include the modern spin on this guy there.